It took us less than a year to decide upon, locate and buy our floating home. This is pretty fast in boat years; many people spend many years in the decision process, and then it can take more years to either find the right used boat, or to spec out and wait for a new one to be built. 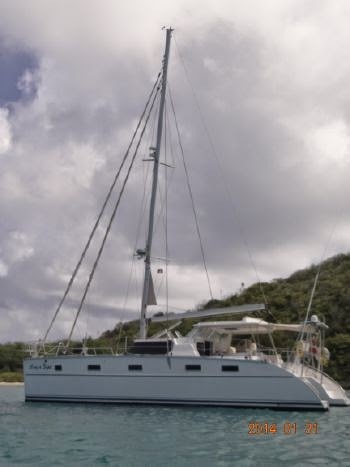 Our good fortune came because we chose an Antares 44i catamaran. We had considered the Antares boat early on. We loved the wood interior and the overall quality of the boat, the shaft drives and that it had an encloseable helm and cockpit, which were important to us – and hard to find all in one boat. 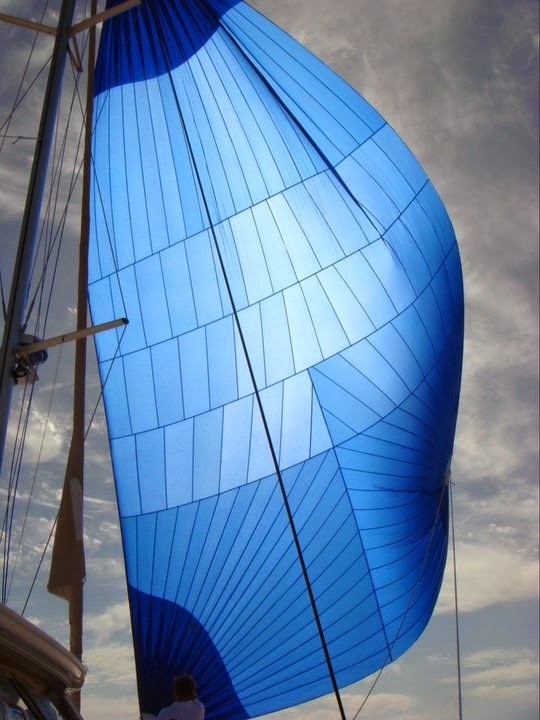 the sailing vessel would have several must have aspects that were based on safety, comfort and sail-ability. After a several boat shows and visits to factories on multiple continents, we narrowed it down to just a couple boats. We put a deposit down on a new Antares 44i build. Fortunately for Antares, the company, but unfortunately for us, there is a great demand for these boats. New Antares boats built at the factory are completely sold out into 2018, and used Antares 44i‘s tend to sell within a week. We had a date when we wanted to have our new boat by (by the dates of Robby and Zack’s graduations from college and Wharton respectively, and in time to sail to the Med for the summer of 2015 to have Hunter, Savannah and Reid join us there), and the completion date of the hull we were going to get wouldn’t have been ready in time. Rob & Jeff from Antares were forthright with us and we appreciated that. Rather than tell us what we wanted to hear, and risk disappointing us by missing our date, they told us honestly when the boat would likely be delivered – fall of 2015 – and since that was too late for our needs, they then sent back the deposit and helped us find a used Antares in bristol condition and whose availability fit our time schedule. The previous owners were experienced sailors and had taken excellent care of the boat. 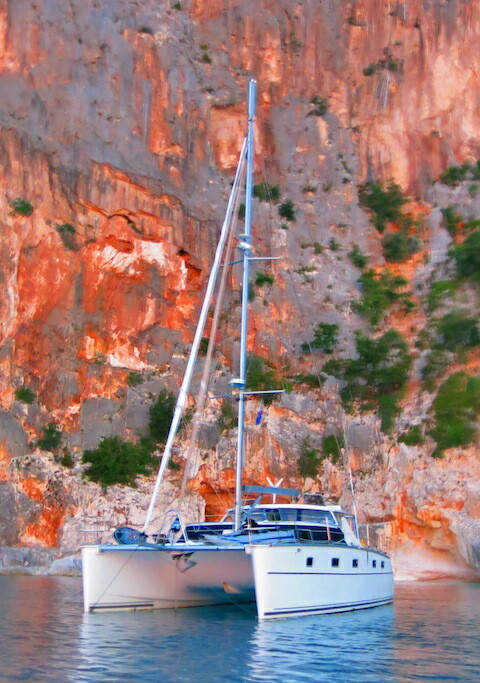 The boat had splashed in early 2011, but the owners had only sailed her for six months a year. The engines were practically brand new, and the previous owners had done all of the new-boat gremlin-catching so when we got her she was very, very solid… how lucky were we! And so, in June 2014 we took possession of Cinq a Sept and after a very formal and intoxicating renaming ceremony, “Golden Glow” was born. We can’t say enough about how highly we regard the Antares Team: Rob and Jeff, Salwa, Paul, and all the people involved with Antares! They have all been incredibly helpful to us, and are honorable and nice people too. The boat’s architect, Ted Clements, put so much thought and wisdom into every part of the boat’s design. He has a blog explaining many of his decisions that is very informative no matter what catamaran you’re sailing. It’s not surprising that they are having such success with Antares and that we have had such success in our journeys on Golden Glow thus far. Through the Antares attention to detail, a great community of fellow Antares owners has evolved that actively share information and support each other. That ‘family’ cliche is very real for Antares owners. In addition to building the most sea-worthy and comfortable, safe, well-designed liveaboard sailing vessel, they also provide the best after-sales support and care…even to second owners like us. Antares sponsors a free Antares University that owners and prospective owners can attend to learn more about their boats. Attending an Antares University in George Town, Exumas, Bahamas in May 2014 and being able to experience the boat and confirm her ease of handling, quality and design, was what solidified our decision to buy an Antares. We’ll probably attend at least one more Antares U now that we own an Antares to learn more from fellow owners and share what we’ve learned about our boat. One thing we’ve learned is how much we miss being on Golden Glow when we aren’t aboard and sailing! Hello can I ask what you do with regards to electric in Europe as I assume your boat is American voltage as looked through the specs and everything for a new Antares44i and very interested in purchasing a new one just concerned about the issue with it being American voltage. Hi Christopher, During our two seasons in the Mediterranean, or whenever we are in a 220volt area and want to hook up to shore power, we use a voltage converter transformer that steps the voltage from 220 to 110. It was only $75 on Amazon – http://amzn.to/2kr4JOk and worth every penny. Small, sturdy, durable and effective. There is one Antares Blue Dawn built for a family from Israel and they had it built with 220v so that’s another possibility if you’re commissioning the factory to build your boat. Enjoy Europe! Would you consider sharing a copy of your spreadsheet w/selection criteria? Congrats on finding the boat! I am so jealous- I saw an Antares at the boat show in Newport a couple of years ago and it was love at first sight. I will be following your exciting journey! We are discussing the Atlantic crossing.